The success of painting is getting to know your mediums and the unusual ways in which they affect each other. Do you allow yourself to play without an anticipated outcome to see what evolves? 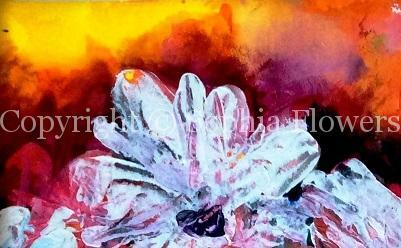 The photo above is part of a painting produced and you can see how the acrylic background is allowed to merge and blend with acrylic ink prior to thick layers of the white petals being introduced. This is then emphasised by bringing in stronger, dark colours nearest the flower before another layer of petal is applied.